Tried making a Noel in the new server Freyja. Any suggestion on which skills to take and which to avoid before changing to Cresentia at lvl 25? Do I need to max diem wind and crucio? My goal is to be a DPS-Debuffer for Raids and with decent AOE skills for grinding. Any suggestion will be greatly appreciated! Thanks guys! Hi Alex ^^ I saw your post in the other thread... Welcome back!! My skill build is mainly for pvp but its very useful outside of it too. During the grinding stage, the main thing I changed was Bram Gush, for mobs. I had that maxed and reduced my Crucio. You will get a reset by the time you reach cres, so don't worry if you want to play around with your Alter skills to get a feel for how they work! Oh wow thanks for the tip! I am just wondering why leave Blind and Stigma mastery 0? I tried using blind and it seems to be quite useful especially if you're role suddenly becomes a temporary tank like on instances if the tank died or healer got dc'ed. Stigma mastery is also not that effective? Finally, with Bram gush I've that skill is really awesome so I can just leave Crucio to 1 and max out Bram Gush instead is that it? Tried the skill build super like! Thanks again @magpi!! Stigma mastery used to be really good when agi was the way to go. Our crit rate isn't that great overall, so I personally felt it was unnecessary and used those points for higher dmg in skills. I used to have it maxed but I didn't see much of a difference. Blindness, In those situations yeah it is useful but its not usable with raw tilt. I found myself never using it so when i reset put those points into other things. I think also the cooldown was pretty long on it, you could get a few raw/furn/cruc combos in before its done. I love Bram Gush too, and actually did just that... left crucio at 1 and maxed it. This was awesome for mobs in the master level. Unfortunately, being maxed out i didn't need it anymore. So went for a more PvP build and removed it for crucio. you replied as i was typing XD You are very welcome!! Edited by magpi, 22 October 2014 - 01:15 PM. I agree. Blindness is great for debuffing attacks. However, I want to be able to kill things faster. By using Raw Tilt to decrease defenses my cruses and physical attacks become more effective. Bram Gush has potential with applying stigma buffs. So if you're caught in a pinch with PvP mob, I've been able to slow down groups with Earth Worm, apply Land of Darkness, and spam Bram Gush. I've been trying to max out Int and Str to get the most out of my attacks. I don't even bother with Vit, Wis, or Agi; which as Noels we don't receive crit that often for Agi. Ok so I've follow magpi's suggestion and it's all pure joy. I am just wondering which stat should I boost besides VIT 50? I am planning to go all INT now. Should I just ignore AGI, go INT-AGI or full INT? So glad it is working for you! INT and STR are the stats to focus on for cres. I'm basically full INT and that build gives impressive DoT damage. Some others go full STR which is good for boosting your skills that require physical damage (like tempest). I've also just recently met a hybrid who was also very powerful! There have been a few debates on what way is best to go, but it really comes down to your play style and experience in the end. Agi is useless now for us. With VIT, I feel like you will be handicapping your damage just for a little HP boost since we don't get a bonus for it. Edited by DazH05, 06 November 2014 - 02:57 PM. That was my old PvP build, I used to use curse burst after EW to finish off while kiting in 1vs1 because of the burst damage because you can use it while running. My current skills are a little different now since i switched out for AoE's again when FP was added. I don't use CB anymore, and have a different method for kiting during pvp. Hi! Can you explain me some details regarding the alter skills? Especially the Curse and Stigma. Thanks! You mean Curse Burst and Stigma? Stigma increase some of Crecentia's skill damage output such as Curst Burst, Land of Darkness and Tempest. It also can be gain when you cast skills such as Diem Wind, Illusion Blade, Bram Gust and Earth Worm. But I didn't max Curse Burst because 100% magic damage scale at level 5 is lower than 220% magic damage scale of Bram Gush at level 5. Curse Burst is one of many fail skills of Crecentia now so I'm not recommend it. Diem Wind - Since you need PvE so we don't need a melee & single target skill. Crucio + Furnuculus - Those skills are good in both PvP & PvE. Furnuculus give you more dps as time go by and Crucio give huge range damage on hit, just spam Crucio whenever you can, don't wait for Crucio's dot & final blow because they are very weak. Land Of Darkness + Curse Reinforce + Earth Worm - Best combo with Bram Gush to deal tons of aoe damage with stable dps around you. Levicorpus - This skills prevent you from dead when being attacked by many monsters at the same time. Good in both PvE & PvP. 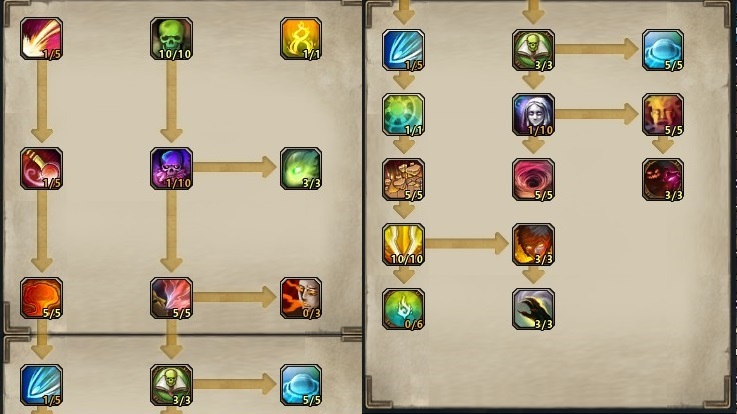 For leveling an Alter, do you recommend to max diem wind and just spam them to mobs? can someone provide a pve build for cresentia? and which pets is important for cres. Any updated guide on Crecentia? crecentia, in my opinion, at ml40 need a re-build skill, with that skill reset scroll i mean. you cna choose what you prefer to use STR or INT based crecentia, soem crecentias uses 50/50 each stat. in my case i go full int, cause i love to spam death grip skill.